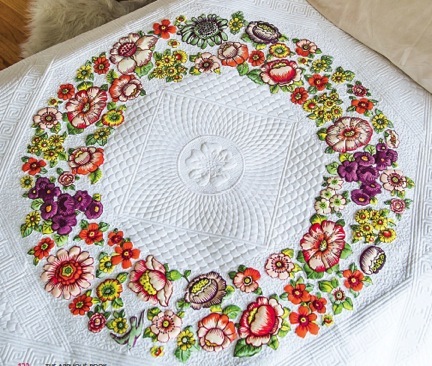 This fun, free-form appliqué project modernizes the traditional technique of Broderie Perse. Both beginning and more advanced students will have fun learning the basics of raw-edge appliqué using fusible web while creating improvised appliqué arrangements using their favorite printed fabrics. *This is a great opportunity to sell large-scale prints that students might not know how to use in other techniques (e.g., piecing); advise students to buy enough print fabric to cut out about 60 motifs of various sizes. Remind students that they will be cutting out individual motifs, as the intricacy of various motifs might influence their choice of fabric. **If the class is divided into two sessions, these supplies are only needed for Session 2. Refer to pp. 122-126 for instructions for the Corona de Flores quilt. Refer to pp. 15-17 and 19-21 for basic information on techniques. 2. Discuss history and technique of Broderie Perse (see p. 123). 4. Cut out appliqués (see p. 125 for tips on cutting the appliqués). 5. Mark background fabric for appliqué placement. 6. Place appliqués within marked guidelines; pin in place. 7. Fuse appliqués to background fabric. *Students may be assigned to complete this task at home before class. **Students will not finish this step in class but will get enough practice to feel confident stitching appliqués at home. 1. Discuss materials and process for fusible-web appliqué and history of Broderie Perse (p. 123). 2. Fuse web to wrong side of appliqué fabrics. *Students may complete this step at home if they do not finish during class time. 1. Mark background fabric for appliqué placement. 2. Arrange appliqués within marked guidelines; pin in place. 3. Fuse appliqués to background fabric. **Students may not finish this step in class but will get enough practice to feel confident stitching appliqués at home.